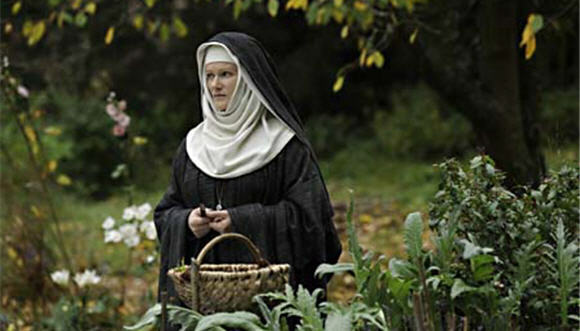 Sister Hildegard possessed amazing powers of divining cures for all diseases using healing herbs and plants found on the spectacular gardens of her nunnery – which is still in full operation to this very day. This remarkable nun was an advisor to the Pope, who regularly sought her out for the crystal clear predictions she gave him on the dynastic struggles happening in the world during that time in history. Hildegard brought sense to the chaos. She attributed her intimate relationship to God for the answers to her prayers and resulting revelations. She was also revered for her special healing creams and lotions she used first on the animals of the nunnery, then on her fellow nuns and village worshippers on the Rhine River in Germany. I stumbled over this very nunnery by accident one weekend while biking through the German countryside with some of my dear friends who taught at Cologne University. They told me the fascinating story of Sister Hildegard’s creams, known to heal all skin ailments, particularly bed sores, psoriasis, acne and impossible rashes. As a marathon runner and avid biker, I was always plagued with jock itch! Nothing worked. We decided to bike up to Bingen one weekend and see this storybook village firsthand and see if the nun’s powers still worked in this modern day and age. The nunnery shop was filled with all her writings, books on revelation the wonderful baroque music she composed playing in the background and her miraculous healing creams. I was tempted to buy the entire store, it was such an awe-inspiring experience. There were creams for every conceivable skin ailment, her fabled anti-aging creams and moisturizers and incredibly, a cream for itching and insect bites. Off we rode back to Cologne joking about finding a nun who could cure the world. To this day, with her Tea Tree Ointment faithfully used each day, my jock itch disappeared – never to come back all these years later. May the same thing happen for you in some small way! We are proud to import these restorative skin products directly from a small nunnery in Germany and introduce you to what we consider to be a small miracle – skin care the Sister Hildegard way – full of the healing, herbal benefits carried down through centuries. Marigold Calendula Herb & Sea Buckthorn Creme – An all-body moisturizing cream for dry, chapped or damaged skin. Apply after bathing or during the day to moisturize dry skin for deeply luxurious moisturized feel! Marigold Calendula (Calendula Officinalis) extracts possess anti-viral, anti-genotoxic and anti-inflammatory properties. It is used topically for reducing inflammation, soothing irritated skin and supporting the repair of damaged skin from radiation or chemical exposure. Sea Buckthorn is also added for moisturizing and restorative effect. Suggested Use: Use after bathing in the morning as an all-body moisturizer. Re-apply throughout the day whenever your skin feels dry, particularly to the back of your hands and after repeated hand washing. I want to tell you how much I love the Marigold & Sea Buckthorn Moisturizer Creme product that I have used for many years. This moisturizer creme is unlike any other product I have ever tried. I use it every day on my face and hands, it makes my skin feel so soft and smells so good I could almost eat it! In 2008 my dog was bit by another dog that left him with a gaping wound on his right side. The wound took months to heal, but left a 2″ X 3″ scarred area which would not grow fur. As the healing progressed, I rubbed Marigold & Sea Buckthorn Moisturizer Creme onto his scar tissue to keep it soft and supple. We’re a online retailer specializing in sea buckthorn. We would be interested in retailing these products. Can someone please contact us…you have our email now. While living in Santa Cruz, CA a while back, and at the Farmer’s Market one day, I bought three creams that I ended up giving away to someone in great pain! One was an Arnica base Cream, second one a based cream of peppermint, and the third one a white one, perhaps, Buckhorn(?) but not sure of this. Anyway, I’m looking for same for a friend to use since it helped me very much when I had a big problem with my ankle—she has sprained hers! The woman that sold to me the creams did mention that, originally, the creams were from a recipe come about/created to aid muscle/problems that horses had with their joints… hope you can find these three marvelous creams to pass on the info to my friend. Thank you very much. @Rubiela Galimany, you are describing a product called Pferdebalsam horse balm with Arnica and Horse Chestnut that we imported many years ago from Germany. Unfortunately this product is no longer available for human use. We developed a topical pain relief cream called Relief containing Emu Oil, Chondroitin (from shark cartilage), Menthol and that works wonders. Previous PostPrevious Love Your Liver and Live Longer!